At one point in Hell or High Water, the new bank robbery movie that takes place in Texas, as younger brother Toby (Chris Pine) goes into a convenience store, his older brother, Tanner (Ben Foster), requests a Dr. Pepper. Toby returns with a Mr. Pibbs, to the consternation of the aforementioned sibling. I’m not sure if the screenwriter Taylor Sheridan is from the Lone Star State, but I do have a feeling that only a native son would understand the egregious wrong that has been committed here. In a recent review, I mentioned that we have George Lucas to thank for utilizing a bad guy that everyone can hate with no political incorrectness: Nazis. But as this movie quickly indicates, there is one bastion of evil that comes a close second: banks. Toby is about to lose the family farm due to bank loans taken out to help pay for his mother’s illness and last days. He can’t pay. Worse yet, oil has been discovered on the land and he wants something to leave his sons (he’s divorced). He and Tanner come up with a solution (which I, personally, found to be rather clever): Rob a series of banks, take only small bills in the tills, go to a casino, trade them for chips, then after a while, return to get a cashier’s check made out to the bank holding the loan. By taking low denominations from the till, the money is untraceable. And laundering the money through the casino is a perfect cover. To add insult to injury, only rob banks in the chain that owns the loan on the farm. To add even more insult to injury, use that bank to oversee the trust for the land he gives to his sons so they won’t want the authorities to look into it. Like I said, pretty neat. Even a work of art. Hell or High Water has an incredibly authentic feel for time and place. The camera often soars above empty, dried out acres of land that seem lonely and devoid of people. Long stretches of highway feel like they go nowhere. The small towns are overblown with dust and sparsely inhabited by people who reveal their characters’ personalities and history with often only one line of dialog (and any movie that begins with that marvelous character actress Dale Dickey is already ahead of the game). It’s so accurate a portrait of Texas, it constantly reminded me of why I left. 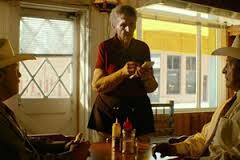 Hell and High Water has many attributes of another Texas crime drama, the Coen brothers’ No Country For Old Men. 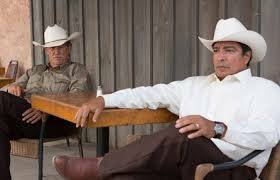 It has a complex story revolving around a crime with an older, nearly retired Texas Ranger (Tommy Lee Jones in No Country…, Jeff Bridges here) standing in for the Greek chorus. 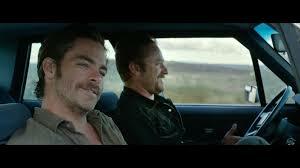 But in many ways, as entertaining as No Country… is, Hell and High Water is a better made movie. Sheridan’s screenplay is expert and the plot holds together in ways No Country… didn’t (No Country… had two issues: a subplot with Woody Harrelson that didn’t go anywhere, and the climax, the death of Josh Bolin’s character, taking place off camera). But like No Country…, Hell… has a certain poetry to it. It’s a lovely and often deeply moving portrait of two brothers and what they are willing to do for each other. In many ways, the plot is structured around a parent telling their kids, you know, if you keep that up, someone is going to get hurt, which never stopped anybody from doing anything, especially brothers. It’s certainly a step up from Sheridan’s previous screenplay Sicario, which never really came together and was clunky at times. What Hell… may not have is the complex cat and mouse game between Brolin and Javier Bardem. Here the game is played between the brothers and the Texas Ranger, and isn’t quite as interesting, especially since, in many ways, as with the same character in No Country…, the Ranger is unnecessary to the plot. The ultimate outcome would more or less be the same whether the Ranger was there or not. This leads to a sad irony at the end. The Ranger’s participation, which was unnecessary, leads to tragedy. And even though it’s the brothers who are in the end culpable, if the Ranger hadn’t insisted on having one last feather in his cap before retiring, there would have been a different result. In playing the Ranger, Jeff Bridges almost seems to revel in playing the old codger and showing off how his body has changed from his leaner years in such films as The Last Picture Show. It’s a role almost impossible for Bridges to do badly. Pine and Foster are excellent as the two brothers. There’s a rapturous scene where the two, sans dialog, go at each other in the playful ways brothers do that tells you everything you need to know about their relationship. The whole movie is heartfelt and packs an emotional punch. Easily one of the best American films of the year. The strong direction is by David McKenzie, the British filmmaker who also gave us Young Adam and Starred Up. Margaret Bowman is the waitress that asks what you don’t want. There are times when you marvel at a movie character’s lack of knowledge that is due to not seeing enough movies. If the trio at the center of the new horror/thriller Don’t Breathe, written by partners Fred Alvarez (who also directed) and Rodo Sayagues, had only seen such fair as Wait Until Dark and See No Evil, they would know that the last thing one does is take on a blind person…; there’s simply no way to win. 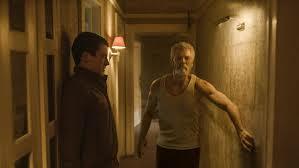 Don’t Breathe is a fun, nasty little horror film made on a relatively low budget. 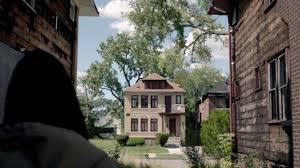 It has one main location, a remodeled house located among a burnt out block of derelict buildings in that city that has become the backdrop de jure for horror films, Detroit (It Follows, Only Lovers Left Alive). There’s something about this building that is unnerving in and of itself. It’s a beautiful edifice, totally devoid of the erosion that has taken over much of the city. But stuck as it is in what almost looks like a war ravaged neighborhood, the beauty feels somewhat intoxicatingly deadly. You just know that there’s something wrong here. The trio that drive the story break into houses. Like the heroes of Hell of High Water, they are very methodical in how they do it such that it’s highly unlikely they will ever be caught (and their MO also has a certain poetry about it). Each have their reasons for stealing. Rocky (Jane Levy) is desperate to get enough money to move to Los Angeles with her young daughter. Her boyfriend Money (Daniel Zovatto) is somewhat of a sociopath and just wants the moolah. Alex (Dylan Minette) is in love with Rocky. The basic premise is an old cliché: the last job someone will do before they have enough money so that they never need to do jobs anymore. And as night follows day, it goes horribly, horribly wrong. This is embodied by Stephen Lang as the Blind Man, a mountain of muscle who harbors secrets that won’t allow for any of the three thieves to leave alive. And he has the brains, skill and brawn, as well as a home that is set up such that it’s more difficult to escape than it is to break in, to help him succeed. Whatever else it is, Don’t Breathe is fun, in a sick sort of way, of course. The filmmakers seem to having a great deal of perverse enjoyment in playing everything out, never more so as when they have a camera gliding through the house and lovingly hesitate on objects that will eventually be used in this ironic take on the nursery rhyme, three blind mice. I wouldn’t think too hard about it, though. I’m not convinced the blind man’s backstory makes a lick of sense and is particularly convincing. Fortunately, all those involved, both behind and in front of the camera, collude very effectively to distract you from it.